A steadily rising market supports our theory that we are astute investors. Fed Chairwoman Janet Yellen reassured investors that the Fed intends to keep interest rates near zero till at least the middle of 2015. The stock market closed out the week at a new high, edging out the high set two weeks ago. In an economy fueled largely by consumer spending, median household income is down 8% since 2007. The Japanese yen broke below $90 this week, a seven year low. At this week’s meeting in Australia, the financial heads of the G-20 countries are seeing increasing economic strains around the globe but particularly in Europe and Asia. (Bloomberg) Housing starts and building permits are getting erratic, jumping up one month only to fall precipitously the next. Using either idle cash or borrowing at historically low interest rates, companies are buying back their own stock at a steady clip to juice per share profits for stockholders. In a candid moment, many researchers will admit the difficulty of overcoming their own biases. Investors are subject to the same myopia that afflicts politics and compromises research. Our biases lead us to ignore or discount some facts. The most damaging bias most of us have is thinking we have made the right decision. The justifications for our investment decisions are sound and logical – until later events reveal the folly underlying those decisions. In the late 1990s, some envisioned the internet marketplace much like a chessboard. The companies who dominated the center of the board, regardless of the cost, reaped hefty stock evaluations. It made sense – until it didn’t. Costs matter. Profits matter. Soros Fund Management, founded in 1969 by George Soros, has a long track record of generating consistently high returns. The secret to Soros’ success as an investor is not that he is right most of the time because he isn’t. Several years ago, his firm estimated that his success ratio was only 53%. George Soros’ success comes from the fact that he knows he is wrong about half of the time, recognizes when he is wrong, abandons his position and minimizes his losses. While most of us are not active traders like Soros, we can pay a bit more attention to the balance in our portfolios. Quarter ending statements will arrive in our mailbox or email inbox in the next few weeks. It would be a good time to assess portfolio allocations and targets. A composite bond index (BND as a proxy) is down a few percent since April 2013 while the stock market has risen 33%. Have we adjusted the balances in our portfolios or is that one of the things that has been on the to-do list for several months? The Census Bureau just released their annual estimate of household income and poverty in the U.S. Measurements of household income must be taken with a grain of salt, so to speak. Say that a married couple with $70K in household income split up. The total income remains the same but the number of households is now two and household income is $35K. Given those caveats, there are some real bummer stats in the report as well as some surprises. Real or inflation adjusted median household income was little changed in 2013 and is 8% lower than in 2007. Median income of white households was $58K in 2013 but for black households, the annual figure was $34K. The ratio of incomes between these two groups has changed little over the past five decades. Since the mid 1980s, the income of white households has lost ground when compared to Asian households. Since the mid-90s, the ratio of Hispanic to white household income has risen. One of the strengths of American society has been the income mobility that our economy generates. The Census Bureau groups incomes by quintiles, like steps on a ladder. Each step is in 20% increments so that households are ranked in the bottom 20%, top 20% or in between. From 2009 – 2011, 30% of those who were on the lowest rung of the income ladder moved up the ladder. During that same period, 32% of those at the top of the ladder moved down the ladder. The poverty rate declined slightly but one in seven households, about 45 million people, is below the poverty threshold. A continuing complaint about the methodology used in computing the poverty level is that non-cash benefits like subsidized housing, medical care, child care and food stamps are not included in the calculations. In the early 60s, before the introduction of social welfare programs, almost one in five households were below the threshold. Remember, the 60s were a boom decade. Various estimates of those who were chronically poor at that time ranged from 10% to 16% of households. In 1969, several years after the introduction of the Great Society programs, the poverty rate was close to 14% (Source), about the same as it now. Conservative commentators will make the case that, over the past fifty years, the U.S. has spent some $22 trillion (2013 dollars) on social welfare programs with little progress in alleviating poverty. During the three year period from 2009 – 2011, years of severe economic stress and political games of “chicken,” the Census Bureau reports that almost 32% of households had a spell of poverty lasting two months or more. The Census Bureau also reports that only 3.5% of households were chronically poor, living under the poverty threshold during the entire three year period. The low percentage of chronically poor is often ignored by those who are antipathetic to social welfare programs. In the aftermath of this past recession, one of the most severe economic downturns of the past century, social welfare programs have provided a temporary helping hand up, a shelter against the economic storm, and cut the long term poverty rate to a quarter of what it was during the booming 60s. Liberals will ignore this success, of course. Instead they will point to the higher figure of temporary poverty to make the case for more welfare spending. More programs and more spending is the liberal brand. Conservative pundits should point at the rather low 3.5% figure of the chronically poor and make the point that we don’t need more welfare spending. But they won’t. Opposed to income transfers as a matter of principle, conservatives don’t want to acknowledge the success of social welfare programs. For those readers who don’t have the time to read the full report, a NY Times article provides a summary. 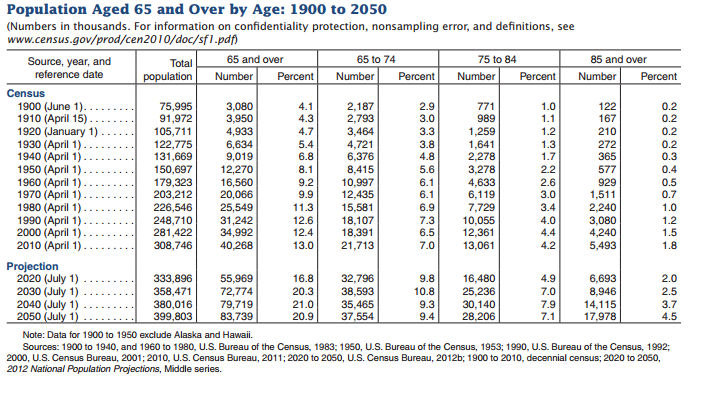 When the Social Security system was enacted in the mid thirties, life expectancy for a 60 year old worker was 72. (Bureau of Labor Statistics Monthly Labor Review, pg. 4) Many of us don’t realize that the largest gains in life expectancy came in the first decades of 20th century with safer sanitation, drinking water and public health facilities. In 2006, the Census Bureau estimated life expectancy for a 60 year old at 82, an additional ten years of life – and retirement benefits and expenses. A 75 year old male today can expect to live to about 87. In their 2014 survey of the costs of elderly care, Genworth Financial found that a home health aide in Colorado averages about $50K. A private room in a nursing home costs $92K per year. At a 4% growth rate, that same private room could cost more than $130K in 2025, when the first cohort of baby boomers reaches 75. How many seniors will be able to afford such an expense? Many will push for ever more programs to subsidize the costs of living longer. Seniors vote so politicians listen. In Japan, the elderly segment of the population has grown from 5% of the population in the 1950s to 25% of the population. (Wikipedia) This aging cohort commands an ever larger share of the nation’s resources, contributing to the stagnation in the Japanese economy for the past 20 years. Pay attention to portfolio allocations. Save money. You’ll need it one of these days.